We’re almost, almost into spring, the sap is rising and there is that special zing in the air which signifies the wheel of the seasons turning once more. Everyone is starting to emerge from their wintery hibernation and fresh ideas abound so I thought it would be a good time to celebrate our Herbal Creativity. This is a very broad topic covering anything that inspires us or encourages our creative side. You might want to share some herbal crafts that you particularly enjoy, a short story or poem inspired by herbs, a herbal drawing or photographs or a recipe that you are particularly proud of, be it culinary, cosmetic or medicinal. This blog party is about ideas you have enjoyed playing with and also about sharing with each other some of the ways in which herbs inspire us in all the many facets of our lives. If you have your own blog then add your post before March 20th and email me the link at whisperingearth@gmail.com -I’ll post the links to all the entries here that evening. If you don’t have a blog but would like to join us anyway you can email your piece as a word document to Debs at the UK Herbarium on debs at herbal-haven dot co dot uk and she will add it to the UK Herbarium blog as a guest post. I also remembered earlier that I am a little late in announcing the winner of my anniversary giveaway. It was Rachel, who wrote the first comment on the post which was nice. I hope you enjoy your oil! 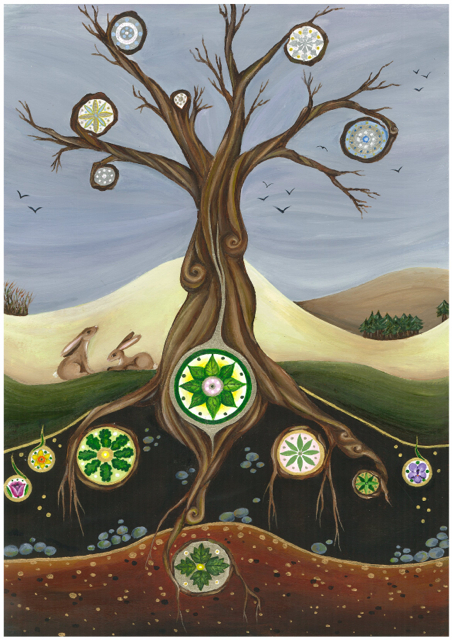 Whilst on the topics of herbal creativity and lateness, here is a painting I did in honour of Imbolc, the Celtic festival which marks the beginning of spring. Imbolc was a month ago now and I hoped to portray the wintery feel that was still all around us at that time but with the promise of spring and potentiality waiting in the earth. It is oft said that the tree already lives in the seed and I like to imagine all the flowers and leaves, already perfectly formed and waiting in the realms of the possible to come forth when the right conditions allow. I hope the spring winds are blowing there too!